Following the reorganization of the company in April 1962, George Bedinger was provided a commission as Captain if he could form a new cavalry company for Colonel Ashby. Considering the fervor with which most of the able young men had volunteered for service at the beginning of he war, it is quite understandable that George Rust was unable to find recruits to fulfill this assignment. On August 11, 1862 he was transferred to Co. “E”, known as the “Emerald Guard”, of 33rd Virginia which was commanded by Col. Edwin G. Lee. On the 17th of July, the men of the Emerald Guard packed their blanket rolls, shouldered arms, left Richmond and began marching northwards for a new campaign, this time against a new Federal Army being organized around Manassas Junction under General John Pope. On 9 August, the brigade would run into Pope at the Battle of Cedar Mountain. The 33rd Regiment fought fiercely throughout the battle, taking 17 casualties. Two days after Cedar Mountain, the regiment would lose one more, Captain Marion Sibert, who coming to terms with his inability to rejoin the Emerald Guard in the field resigned his commission as Captain on 11 August 1862. 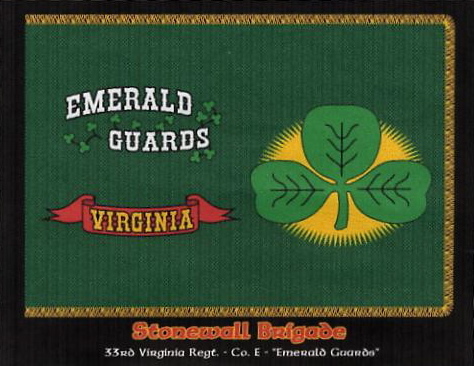 [i] Ridenbaugh, Lowell, 1987, 33rd Virginia Infantry, Lynchburg, H. E. Howard Inc.
http://33rdvacoe.yolasite.com/emerald-guard-history.php, accessed 18 March 2016..